Hitting more than three dozen different spots during the day, FLW Tour pro bass fishing star David Dudley bolted out of the starting gates on Thursday, Aug. 14 to grab the Day One lead of the 2014 Forrest Wood Cup on South Carolina's Lake Murray. By day's end, Dudley was able to weigh in five fish that tipped the scales to 17 pounds, 14 ounces. That was good enough for Dudley to have a 3-pound, 5-ounce advantage over second place anglers Cody Meyer and Bryan Thrift, who each ended the day with 14 pounds, 9 ounces. Rounding out the Top-10 on Day One of the FLW championship was former Forrest Wood Cup champion and Major League Fishing champion Brent Ehrler in sixth place with 13 pounds, 5 ounces. Anthony Gagliardi sat in seventh place at 13 pounds, 2 ounces, while Andy Morgan was in eighth with 12 pounds, 10 ounces. Former Forrest Wood Cup champion and Major League Fishing Select pro Jacob Wheeler was in ninth place after the first round with 12 pounds, 5 ounces, while Barry Wilson occupied 10th with 11 pounds, 8 ounces. Despite grabbing the early lead, Dudley admitted that he was still scratching his head somewhat while attempting to decipher a winning pattern, or patterns, on Murray. Dudley, who won the 2003 Cup, landed only seven keepers on the day according to FLWOutdoors.com reports. He indicated that he found the fish he did catch in both shallow and offshore waters. “These bass aren't holding on any particular cover,” said Dudley, who has posted seven career FLW victories on his resume. The veteran FLW Tour pro plans to stay offshore during Friday's second round in an effort to build on his Day One lead and momentum. Does the idea of winning a second Cup give Dudley extra motivation this week? Absolutely. 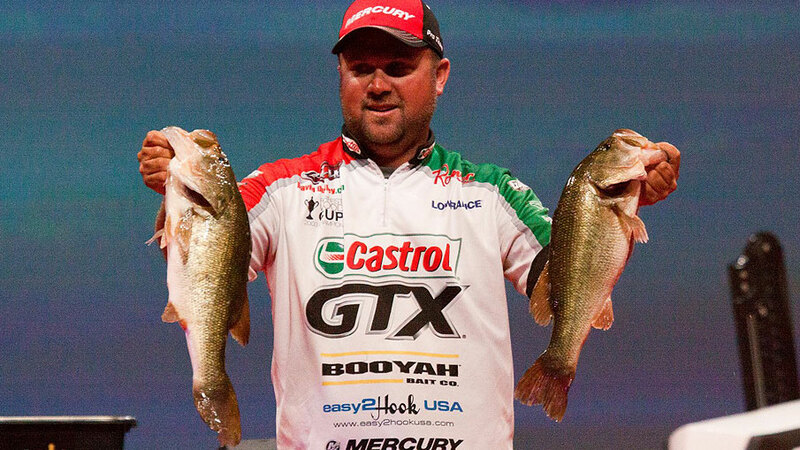 If it sounds like the overall fishing at Lake Murray was tough on Day One, it was. According to FLWOutdoors.com reports, the Forrest Wood Cup field of 45 anglers only managed to weigh in 17 limits on the day. Specifically, 150 bass were caught and weighed in for a total field weight of 356 pounds, 11 ounces. The Aug. 14-18 Forrest Wood Cup tournament continues through Sunday. For more information, visit www.flwoutdoors.com.